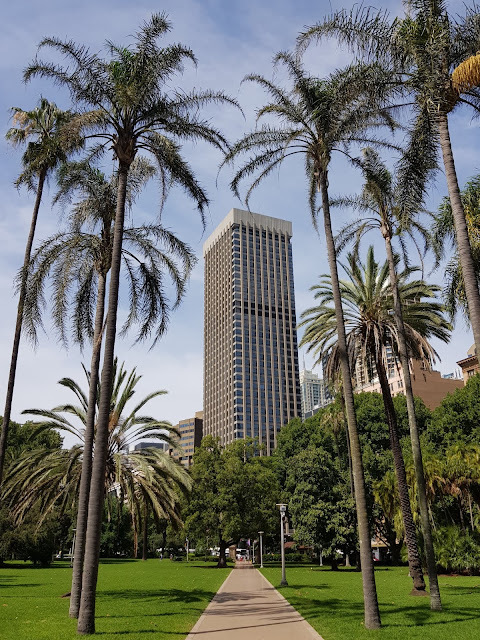 Walking along the footpath in Hyde Park, looking past the palm trees to the Pacific Power Building, on the corner of Elizabeth Street and Park Street. Everything looks quite lush in the park. We've had a bit of rain recentlyso everything is green right now. A lot of city development crowded out any open land that still survived. Thankfully walking along the footpath in Hyde Park shows that some open park land survives. Looks so a bit like Africa. What a beautiful view of the path and the building between the palm trees.